The European Union has provisionally approved new laws to make a raft of driver assistance systems compulsory on all new cars from 2022. Although several technologies are to be mandated, including Autonomous Emergency Braking, Electronic Lane Keeping and driver distraction warnings, media focus has been on Intelligent Speed Assistance systems. Matthew Avery, leading car safety expert and Director of Insurance Research at Thatcham Research comments, “Excessive or inappropriate speed is a factor in the causation and severity of many road accidents. In the UK, 15% of all fatalities are related to excessive or inappropriate speeding. 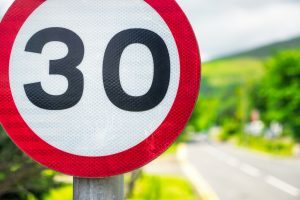 Limits are intended to keep traffic speeds at an appropriate level for a given environment, ensuring the safety of motorists and other road users. Greater adherence to speed limits would avert many accidents and mitigate the effects of those that do occur. “Many drivers want to remain safe and drive within the law, however they can find identifying when to change from one speed limit to another difficult and distracting. In this respect, Intelligent Speed Assistance (ISA) systems will help to keep drivers safe and legal. “There could also be a danger that drivers ‘adapt’ to the system – and come to over-rely on it, planting their throttle to the floor in the expectation that the car will control the speed. This could be a distraction danger and lead to speeding fines if the system is not picking up the limit correctly. And drivers will still be liable, whether they were relying on the system or not. Intelligent Speed Assistance systems use GPS mapping and actively read speed signs informing the driver of the present limit. They can issue a warning to the driver when the car’s speed is above the set threshold and can actively prevent the car from exceeding or maintaining the set speed. They can also advise the driver of upcoming limits. The legislation also suggests that the systems should also be ‘default on’, manually cancellable and recycle on the ignition cycle, meaning the system resets to the ‘default on’ setting every time the car is restarted. Much of the media coverage has focused on ISA, but if finally approved the laws will also make Autonomous Emergency Braking technology compulsory.